Externally, with its stepped metal top plate and concealed screws the Olympus PEN E-P5 bears the closest resemblance yet to its film-era predecessors of the 60’s. Internally, as you might expect, the camera couldn’t be more different. Like the vaunted OM-D E-M5, the latest PEN has a 16-Mpix LMOS type sensor mounted on a stabilized platform that helps reduce blur from camera shake on 5 axes, as well as continuous shooting at up to 9fps. The new model even adds some features that the OM-D lacks such as a focus peaking, a new mechanical shutter with a top speed of 1/8000th sec (very useful shooting wide-open at f/1.4 or 1.8), and built-in flash and WiFi. It also boasts a new optionally available articulated electronic viewfinder (EVF), the $279 VF-4, which has a higher resolution (2.36 million dot) and a larger, magnified view for improved clarity. Of course the camera is just a part of the system; the lens is arguably the more important and should be considered as a longer-term investment. 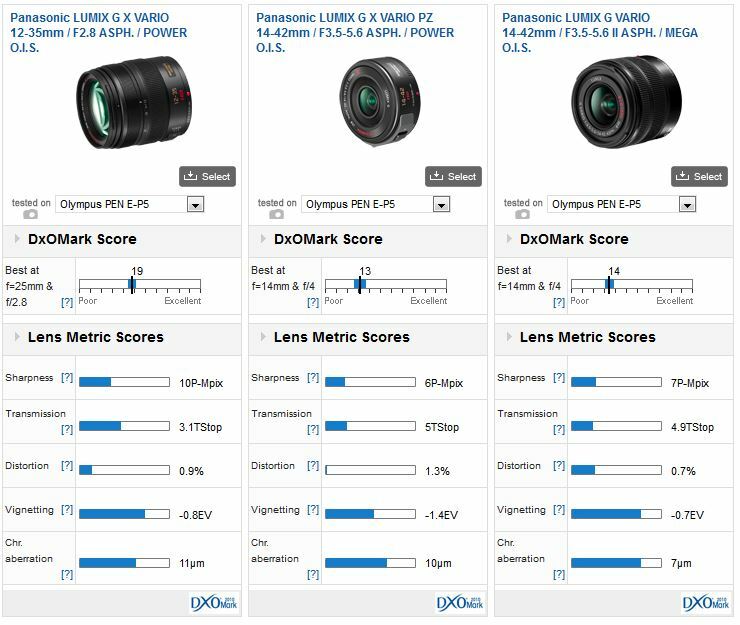 We’ve analyzed 22 lens models from Olympus, Panasonic and Sigma, and while we’ve not covered every model available it’s still an extensive range from which to make a considered choice. Although there are some very promising manual focus models available from third parties such as the Voigtlander Nokton 25mm f/0.95 (that we’ve not yet been able to analyze) standard lenses from the camera makers are somewhat lacking in choice but that’s likely due to the early introduction by Panasonic of the Leica Summilux DG 25mm f/1.4. 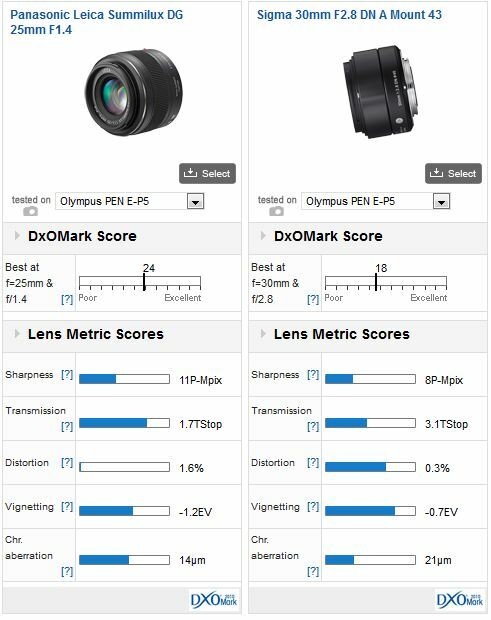 With a DxOMark lens score of 23, it’s the best performing standard lens in our database for the PEN E-P5. This high-speed 50mm f/1.4 equivalent lens is an excellent performer optically, and with a fast and smooth-focusing linear type AF motor it’s suitable for both stills and video capture. At $579 it’s not for everyone though. Independent makes Sigma’s recently redesigned 30mm f/2.8 DN A (60mm equivalent) performs well. 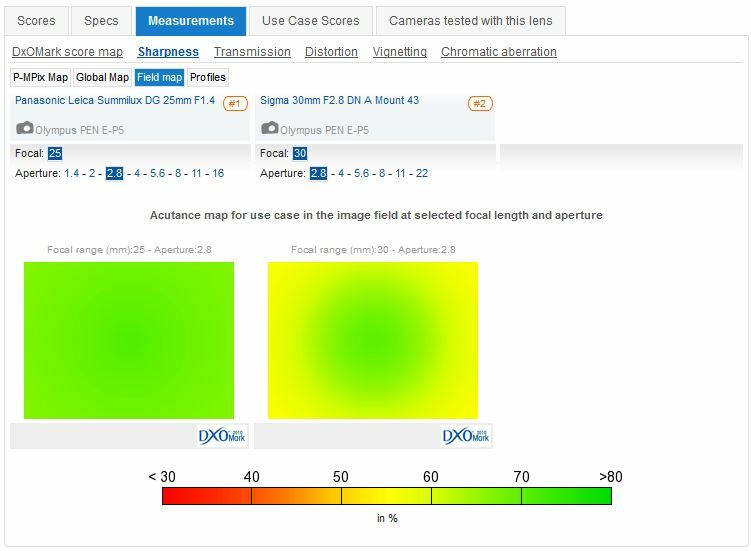 These DN models share the same optical design (and image circle) of Sony’s E-mount APS-C cameras and that should help maintain image quality. It achieves a DxOMark score of 18, and an 8P-MPix score for Sharpness. Distortion and vignetting are low but unfortunately, chromatic aberration is high. 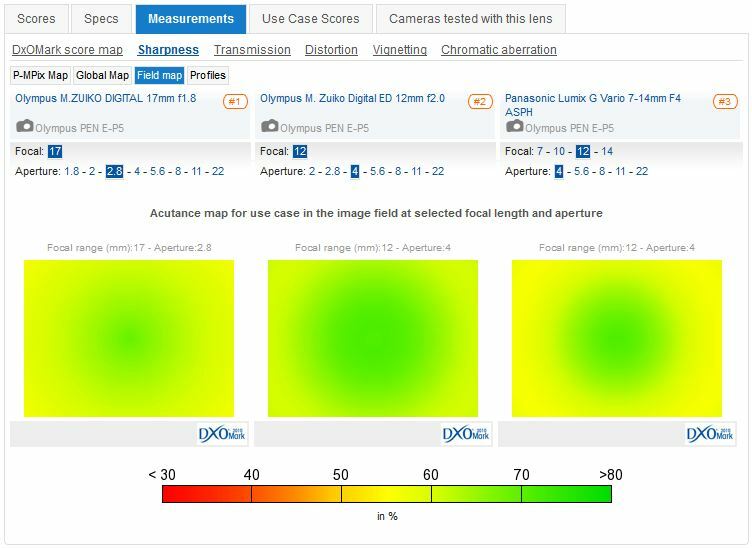 Unlike their Panasonic counterparts, Olympus cameras don’t correct lateral chromatic aberration in-camera, but distortion and vignetting are, so some of these imaging characteristics may not be readily apparent. At f/2.8 the Leica is sharp across the field, the Sigma not so much. We’ve yet to assess the range of Olympus ‘starter’ kit lenses on the PEN E-P5, however, if you’re looking to replace it with a faster (brighter) model then there is just one lens currently offered, the Lumix G X Vario 12-35mm (24-70mm equivalent) f2.8 ASPH Power OIS from Panasonic. At $1,100 it’s hardly surprising to see it sits at the top of the four models we’ve have analysed so far. Although quite a large and heavy lens this stabilised zoom has very good image quality throughout the range with optimal performance being achieved at 25mm at f/4. If portability is important, Panasonic’s ‘pancake’ zoom; the $399 Lumix G X Vario PZ 14-42mm f/3.5-5.6 II ASPH Mega OIS is light in weight (95g) and tiny when stored (just 27mm in length) though it extends on powering up. Bear in mind it’s video-oriented with a power-zoom feature (like the $499 Olympus 12-50mm f/3.5-6.3 EZ) and a manual focus lever. 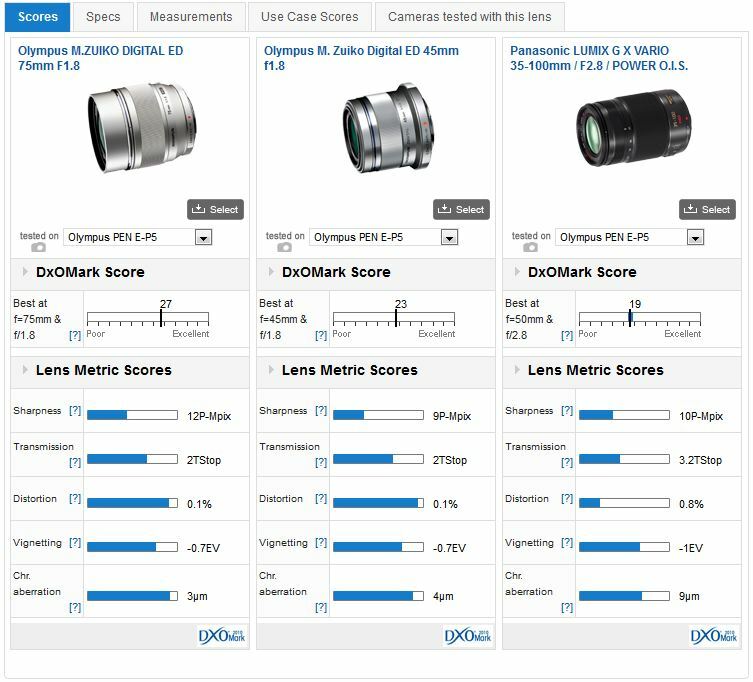 While we’ve yet to analyse the Panasonic Lumix G 20mm f1.7 models or the 14mm f2.5, the best performing prime in the database is the new $500 Olympus 17mm (35mm equivalent) f1.8 with a DxOMark lens score of 22 points. 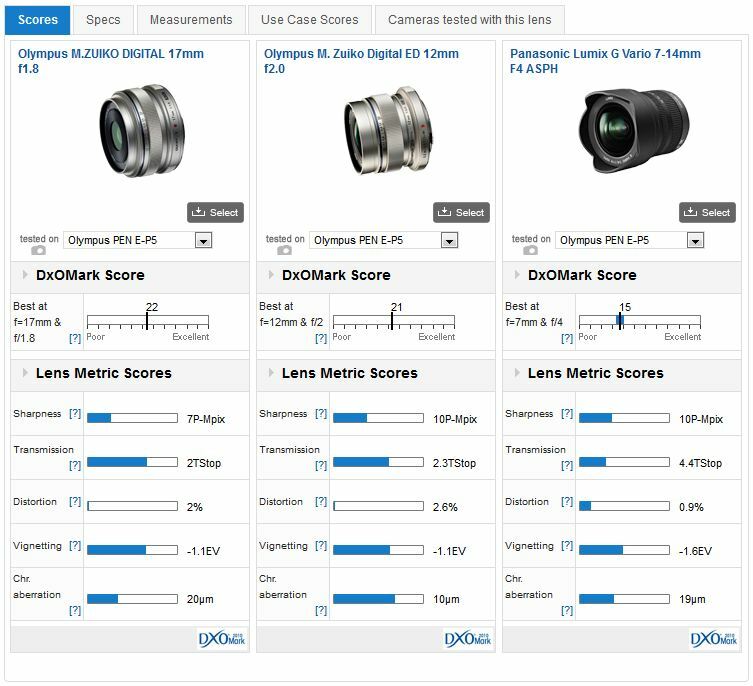 If image sharpness alone is the most important criteria, with a P-MPix score of 10 the Olympus M.Zuiko Digital ED 12mm (24mm) f/2.0 is the highest performing of those tested. Although the 17mm (35mm equivalent) f/1.8 is one and a third stop faster than the f/2.8 version its overall sharpness is similar. Another option to consider is the ultra-wide Panasonic Lumix G Vario 7-14mm (14-28mm equivalent) f/4 ASPH zoom. At just $1,000 it’s not exactly cheap but with a f/4 maximum aperture it remains highly portable and with a 10P-Mpix sharpness score it’s an very good performer optically. Like most zooms better results can be seen at the shorter end but it compares favourably with the Olympus M.Zuiko Digital ED 12mm f2.0 in sharpness at 12mm (albeit with not quite the same edge-to-edge performance). 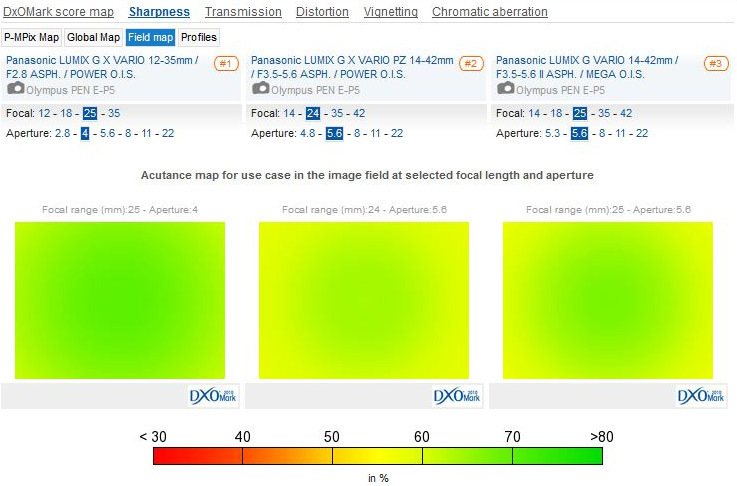 The Panasonic Lumix G Vario 7-14mm f/4 may be an option. It compares favourably with the Olympus 12mm f/2.0 in the centre of the field and has better sharpness still at wider focal lengths. The 17mm f/1.8 is appealing for its full-aperture but even two stops down sharpness levels are somewhat disappointing. Without doubt the highest performing telephoto lens in our database on the E-P5 is the $899 75mm f/1.8. Not only does it have a fast maximum aperture and fabulous build quality it has excellent sharpness from full aperture. However, it isn’t exactly accessibly priced and as the equivalent to 150mm (on a 35mm DSLR) it’s a somewhat odd focal length. A far more portable and less pricey option is the Olympus 45mm (90mm equivalent) f/1.8. At $389 it performs very well with low vignetting and CA but it can’t quite match the 75mm in sharpness (either at full aperture or even when stopped down). At $239, the Sigma 60mm f/2.8 is good value but it’s one and a third stops slower and with a similar angle of view to a 120mm it’s perhaps a bit long for indoor portraits. We’ve yet to assess many of the Olympus telephoto zooms on the PEN E-P5 but out of the Panasonic models the semi-pro grade Lumix G Vario 35-100mm (70-200mm) f/2.8 Mega OIS is the best performer optically. This stabilised and weather-proof model is far above other telephoto-zoom models in optical quality, with it approaching the performance of some primes. At $1,300 it is a serious investment but sharpness is excellent at all full aperture, except at the 100mm focal length where even at that setting by f4 it has improved considerably across the field. 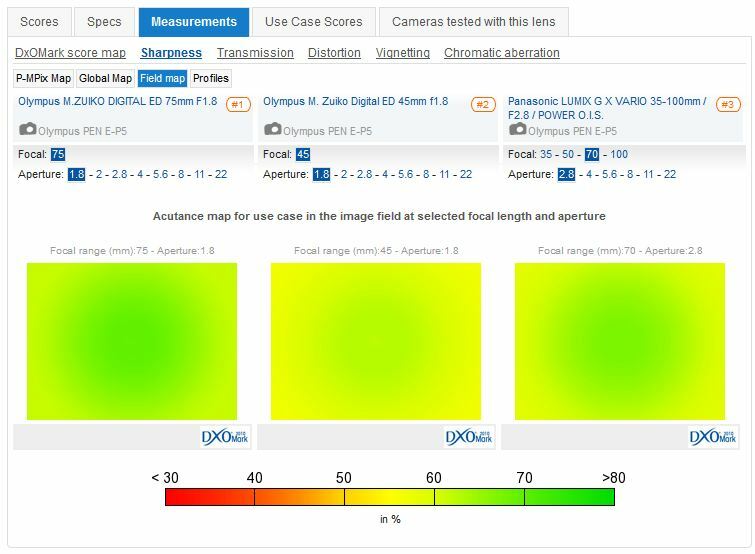 Although the 75mm f/1.8 performs well at the maximum aperture, the Panasonic 35-100mm isn’t far behind (at 70mm f/2.8). Optical performance is better at the shorter focal lengths, though stopped down to f/4 sharpness is very good across the field at the 100mm (200mm equivalent) setting. Best value of those tested is, arguably, the Lumix G Vario 45-200mm f/4.0-5.6. At $255 it’s on a par optically with more pricey offerings and yet offers a versatile range of focal lengths and as with others from Panasonic it has image-stabilization. Whether this option is useful with the excellent built-in stabilisation of the PEN E-P5 is debatable, but at least you have the choice. 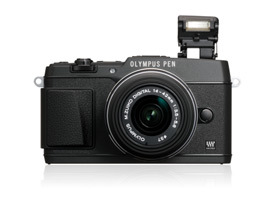 If you have an Olympus PEN E-P5 and a favorite lens, we would very much like to hear from you. Please leave a comment below, stating what lens it is and why you like it.